I’m back after a long hiatus from the Status Update. But it’s not my fault. We have been busy. For our latest adventure this past weekend, I played a minister. See the story, Marryin’ Joseph, in the People section of the blog. This took considerable time, requiring a couple of meetings prior to the event, plus all day during the event. The weekend past was quite busy, indeed. We met on Saturday with William Zhong and Lin Dan to make final preparations for the wedding ceremony. But then–we had to rush home and prepare to go to the China National Tea Museum and the Long Jing Tea Village. This was also quite an episode. 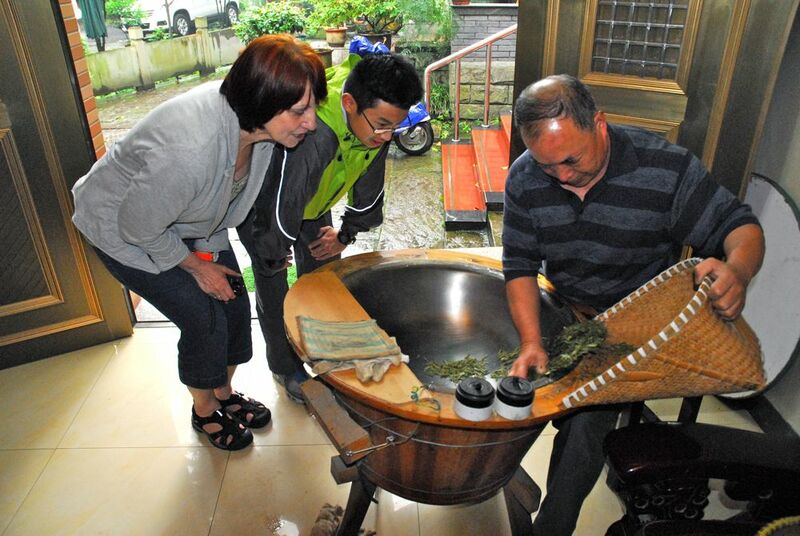 Xu Shun Hao roasts Long Jing Tea in his house as Char and one of her students, Stoney, look on. Stoney is the son of Rong Rong Lu and Rocky Wu, our hosts during our trip to the Long Jing Tea village. I am not a tea drinker, but this stuff was pretty good. Quite mild. Very tasty. Our hosts, Rong Rong Lu (don’t you love that name), a teacher at Hangzhou Foreign Language School (HFLS) and her husband, Rocky Woo (don’t you love THAT name), took us to the home of one of the Long Jing tea farmers, where we had tea and lunch. We received a demonstration of how the tea leave are pan-fired and roasted. Rocky is a tea buyer, so we were confident that what we were seeing and drinking and, ultimately, buying was truly authentic Long Jing tea. In fact, there are various definitions of Long Jing; however, authentic Long Jing tea at least has to come from Zhejiang province in China, with the most conservative definition restricting the type to the various villages and plantations in the West Lake area in Hangzhou. That’s where we were. But then, we had to rush home so that we could catch the bus to a local university for a stage production by college students of Mama Mia. The production was entirely in Chinese, but we couldn’t help but hum along with those familiar songs by ABBA. We got home at 10 p.m. So Monday, in an effort to catch our breath, we got up about 10 a.m. and grabbed the 82 bus to Ellen’s where we had a leisurely Caesar salad (Chinese version) and a couple of hamburgers and french fries. While it was more or less an easy-going day (I didn’t have to start work until evening), we did have to be back home by 4 p.m. because Char had an appointment with three other teachers to go for her (second) back massage. She comes back a little black and blue from these things, but always singing the praises of a massage. The masseuses were young Chinese girls and, of course, they wanted their picture taken with the western women so they could show their moms! But now, rewind to the previous weekend–May 11-13. I took a day off of work that Friday because some of the teachers from HFLS were headed on an outing to the canal town of Wuzhen. What a cool place that was. We packed in a van and took a two-hour drive north from Hangzhou–complete with a road construction, weekend traffic snarl that allowed us to get to know one another. Wuzhen is one of those places w\here it is difficult to take a bad picture. This is an interesting city that I would like to take more time to explore. I still wonder just how they accomplished this 1,300 years ago. 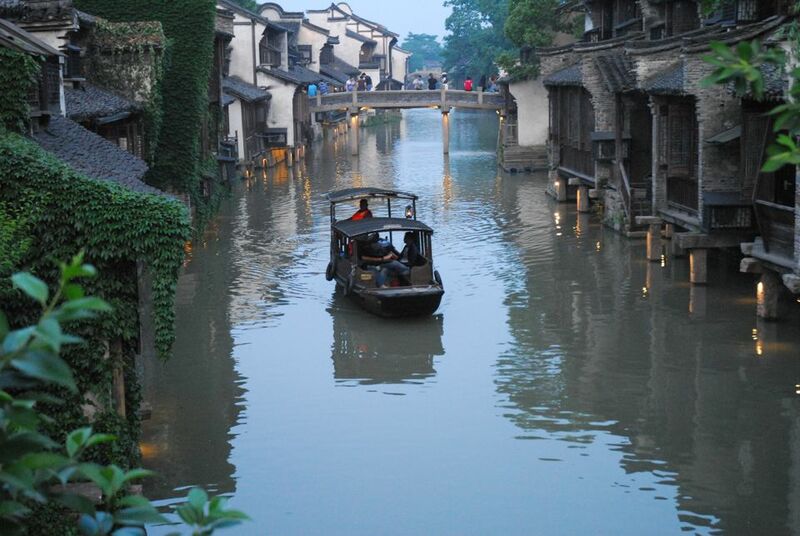 Wuzhen is a 1,300-year-old city that has been purchased and renovated by a commercial company. The old city, located in the south Yangtze River Delta, is now a tourist attraction, but the management has done a wonderful job of preserving the feeling of the buildings, streets, waterways, and commerce of ancient China. We stayed over night in what would have been someone’s house, eating our complimentary breakfast in a kitchen that overlooked the city’s waterway. Our trip was much shorter than we would have liked. We arrived on Friday about 4 p.m. and were on our way again by noon Saturday. We had to move along because our group leader, Bao Xiaoming (an English teacher who is in charge of the foreign English teachers), said we had a luncheon appointment. Oh, my–did we ever! Turns out that one of the parents, whose son attends HFLS, wanted to buy us lunch in appreciation of the teachers’ work at the school. We tried to count the number on entres that were served during our lunch. As best as we could, we counted between 22 and 25. By the time I took this photo, many of the dishes had been removed. More were on the way. 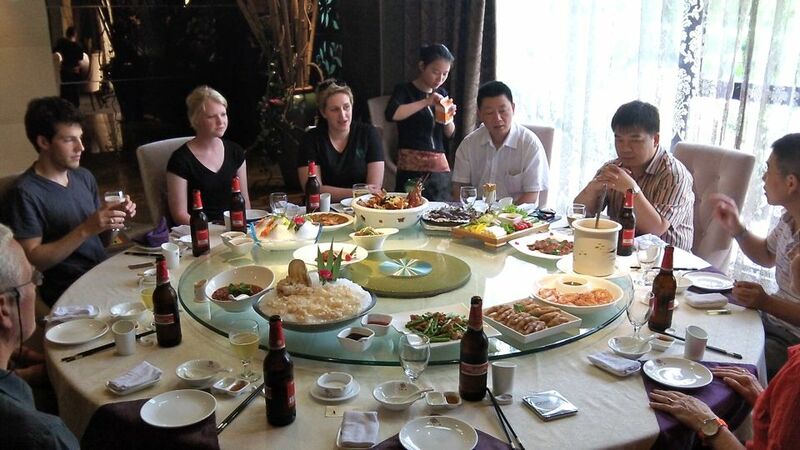 In the common Chinese restaurant style, the food is placed on a turntable and then rotated to allow all diners to choose their fare. Ten of us, including our host, seated ourselves around a table of at least eight feet in diameter. Serving commenced and we must have been served at least 25 entres. We probably spent over two hours eating. But perhaps most interesting, we got our host’s views on business and education in China. A memorable lunch indeed. The following morning, Sunday the 13th, we found ourselves on the bus headed for the home of Wang Min, one of the HFLS teachers. 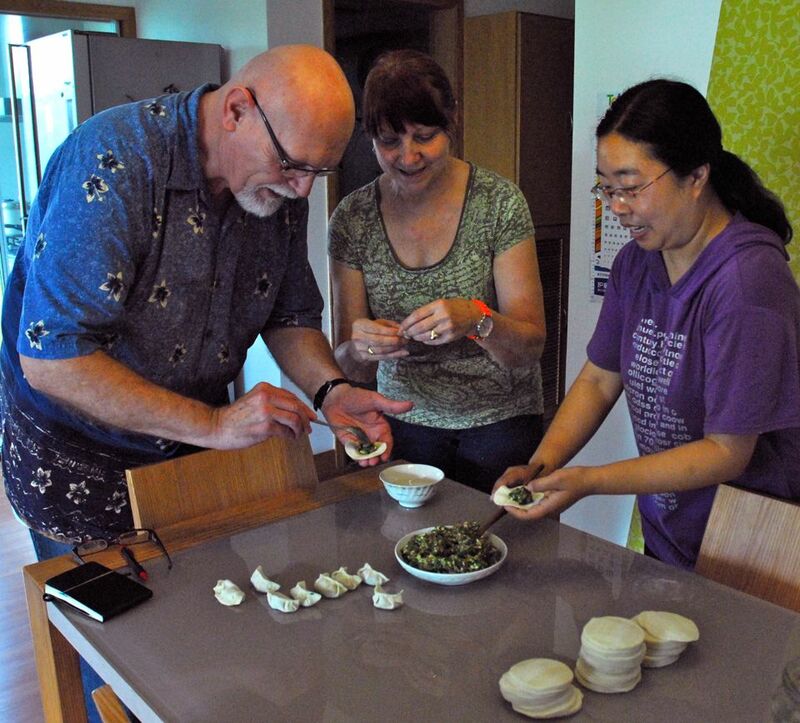 We had a 10:30 appointment for a cooking class–we were to learn to make dumplings. Wang Min’s husband, Feng, her mother-in-law, and her nine-year-old son were there. They live in an apartment, of course, and we got a first-hand look at typical Chinese city dwellers. Wang Min showed Char and me how to stuff and seal dumplings. This was quite interesting and a lot of fun. Plus, we got to eat them as well. Wang Min’s mother-in-law provided a demonstration of how to prepare the filling. Then we learned how to roll our own Chinese dumplings (actually, we pinch them rather than roll them). We further learned that the northern Chinese prefer to fry the dumplings, while southern Chinese prefer to boil them. We did both. Expect to be served dumplings at a future dinner party. We made a video of much of what we did at Wang Min’s apartment, mostly to have a record of how to do it. If you like, take a look at the video at the end of this link (you will probably have to copy and paste it into your browser). It’s just a small part of what we did, but it will give you the idea. So that catches us up to this week. Tonight, Thursday, May 24, Char is off to school for drama night at the Foreign Languages Festival. I would have accompanied her, but I have to work (the night shift, you know). Tomorrow we both will act as judges for a speech contest at HFLS. Char will be judging one group, I another. I will be judging students whose topic is the Internet. My job is to score them and then ask a question. Hmm. That could get interesting. We will leave from school and catch a cab to the train station. We will be spending three nights in Shanghai, which is only about an hour’s train ride down the track. This has been on our agenda for some time, but we decided to take advantage of the Memorial Day time off that I get from my company to allow us more than just an overnight visit. Next Thursday, the 31st, we have a tentative appointment with a couple of teachers for dinner at a hot pot restaurant, which is a really fascinating. Basically, you order plates of raw vegetables and meats, then cook dinner yourself in a pot of boiling broth in the center of the table. It is tremendous fun. 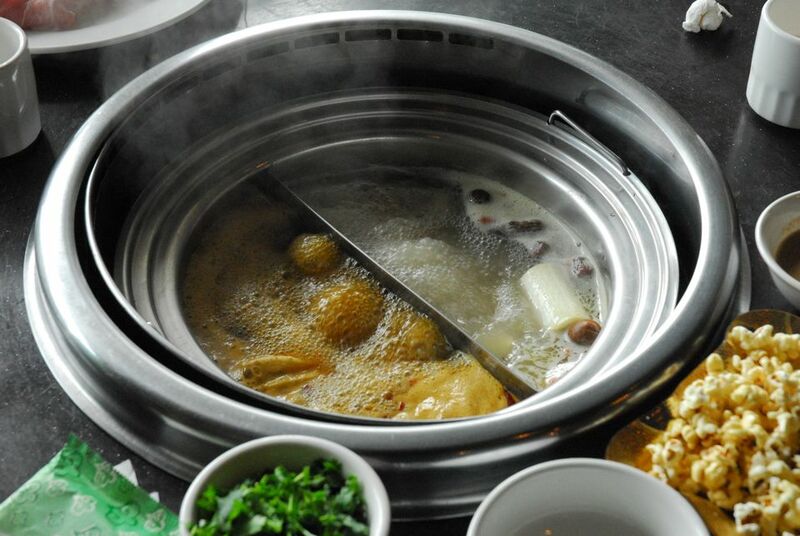 Here you see one type of hot pot. This one actually has two reservoires–one for a spicy broth and one for not-spicy broth. Diners take the raw vegies and meats they have ordered and cook them in the pot. Various dipping sauces are usually available. Saturday, June 2, we will head north again for a few hours to visit the canal town of Xitang. This town is similar to Wuzhen, but is not as formally commercialized. It is a quaint little village, as I understand it, also on the Yangtze River Delta and not that far from Wuzhen. Xitang was on my list of sites to see prior to my leaving Minnesota. The following Saturday, June 9, we have been invited to the graduation of our translator, Zhou Eryi (English name, Nancy). We were most honored to receive her invitation. She is a bright kid who is headed for university in Beijing. And then, finally, Char’s last day of school is Friday, June 15. I’m not so sure how she is going to handle that; she is quite fond of these kids and I think leaving them may tug at her heart-strings. After that, the only other matter on our agenda is to connect once again with Lin Dan, which we hope to do sometime prior to our return home on the 27th. So between now and then, as time permits, I will try to be more attentive to this Web site. I probably have 10 times as much material remaining to be produced as I have posted so far. Joe and Char, just such a fantastic report! So sorry it is almost over as I’m sure you are, too. I have so enjoyed reading about your China adventures! Can’t wait to hear about the ones you can’t write about..